Once the Fastest Production Car of all-time, the Jaguar XJ220 was V12-powered supercar developed by a group of Jaguar employees in their spare time. Unveiled at the British International Motor Show in 1988, the Jaguar XJ220 was produced from 1992 to 1994. Throughout 1992, it held the Fastest Production Car Record, recording a speed of 213.478 MPH–the top speed was suppose to be 220 MPH, hence the “220” in XJ220. 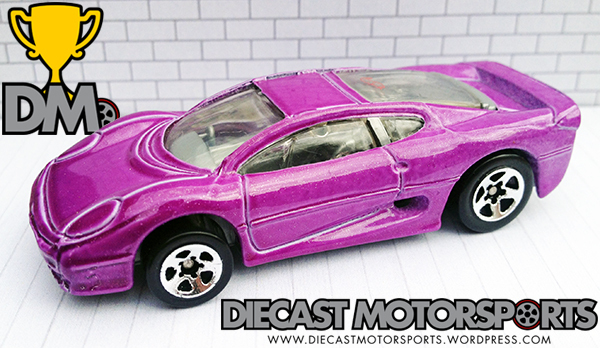 The Hot Wheels Jaguar XJ220 arrived in 1993 and was 1 of 3 cars that got me into collecting. Designed by the great Larry Wood, its smooth, long body with V12 engine in the back, appealed to this 10-year-old boy in 1993. I won the original release playing a game at a carnival. Who knew winning that car on that fateful day would have such an impact on my life? The purple version shown below is great for a variety of reasons. First, the clear windows on this release allow for you to see that V12 engine through the rear window–an engine that would finally get detailed in one casting’s last releases in 2011. Secondly, if you love variations, the Super Show Cars 5-Pack this was included in, was a variation factory, producing not only a couple variations of the XJ220, but variations on the other 4 cars in the pack. RELEASE DETAILS: Metalflake Purple Body (metal). Clear Windows. Gray Interior. Chrome 5-Spoke (5SP) Wheels. Gray Base (plastic). Made in Malaysia. Toy# 13502. Released in 1996 in the Super Show Cars 5-Pack.